Kathleen had to have surgery today, and due to the requirements of it, we had to go to the West L.A. Kaiser hospital. They said it would take 2-3 hours, and that I should be available during that time. Since just sitting in the waiting room is just excruciating, I made sure they had my cell phone number, and I brought my bike along to scout out some possible sightseeing for the Sunday morning bike club ride. 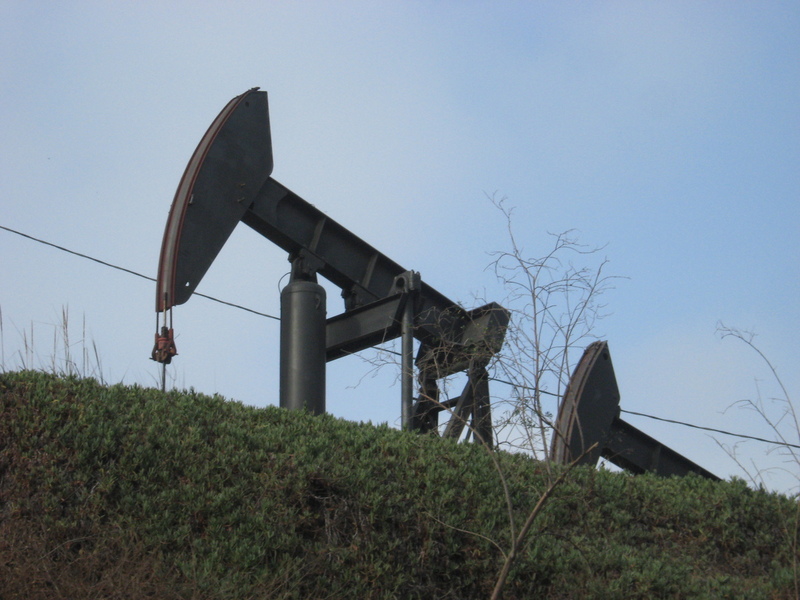 Since we’ve done a couple of rides to see different aspects of the history of the Los Angeles oil fields, I’ve done a bit of reading about this. 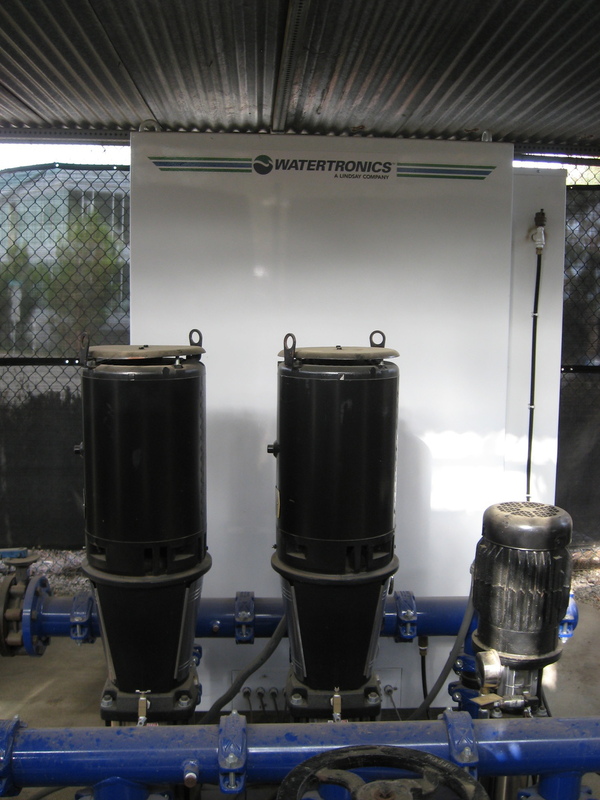 And I ran across an article about fracking wastewater disposal that mentioned polluted water bubbling up out of the ground in a dog park on the west side of L.A. They weren’t very specific about where it was, and when I finally tracked it down, it turned out to actually be in Culver City. But as it turns out, this is just a couple of miles from the Kaiser West L.A. facility, so I had my first sightseeing destination. To get there, I rode down Venice Blvd, which isn’t nearly as bad as it sounds like it would be on a Thursday morning. There is a bike lane, and it was really only a problem going under the big bridge under construction for the Metro Expo Line. 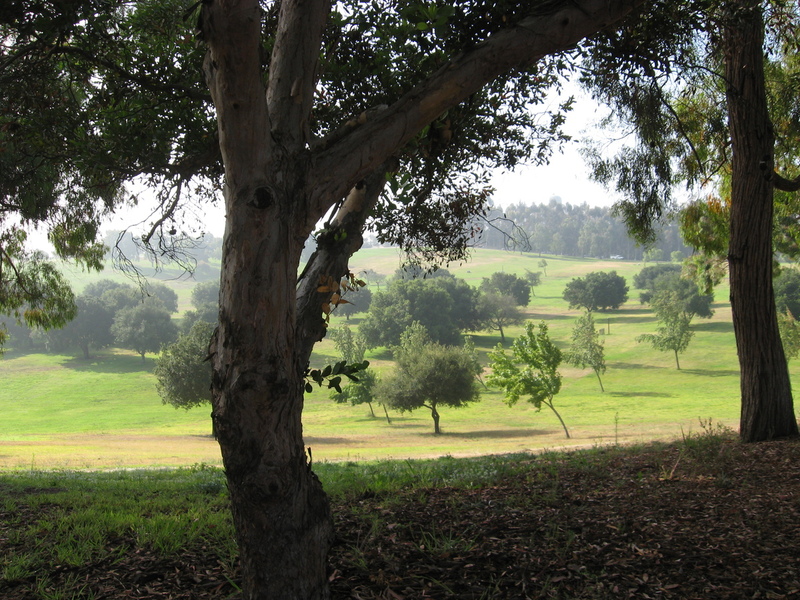 Then I turned on Culver Blvd and rode over to the park in Culver City. 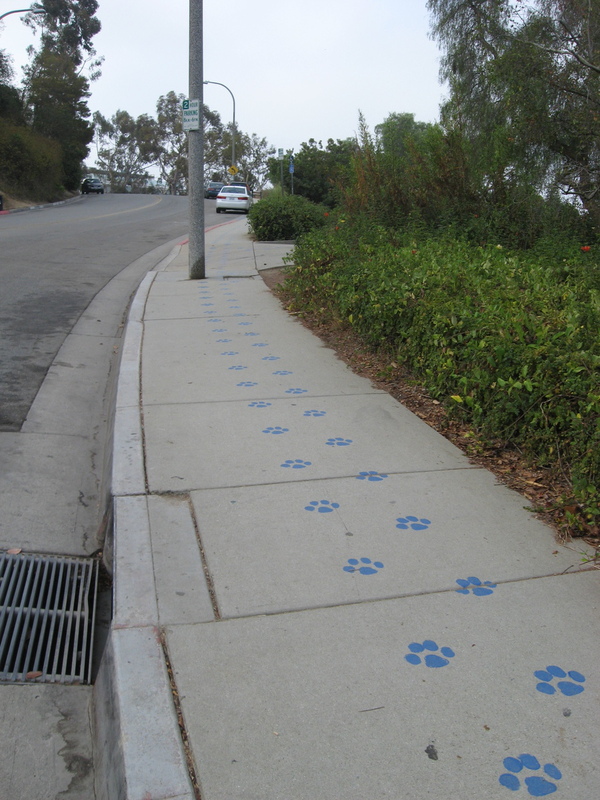 There was a line of pawprints painted on the sidewalk marking the way to the dog park. When I got there, it was an acre or so of dirt, complete with oil wells pumping away just up the hillside beyond the fence. There was also a little fenced-in enclosure across the street from the entrance, with humming equipment inside that was pretty obviously something to do with the oil field. Another recent sightseeing theme on the Sunday morning ride was to see the Mulholland Dam and the Hollywood Reservoir. This came out of having gone to a talk about the St. Francis Dam disaster in 1928, which is considered to be one of the worst civil engineering failures of the 20th century. During that talk, they mentioned that the dam collapse is largely forgotten in Los Angeles, possibly because all the death and destruction it caused happened far outside the city. So during the question-and-answer period, I asked the panel to compare this to the 1963 Baldwin Hills Dam collapse, which is also kind of forgotten, even though it happened within the Los Angeles city limits, just about 8 miles west of downtown. They said that they thought that that was probably because of the combination of the fact that the destruction it caused was much less than the St. Francis Dam, and also because it happened in December, 1963, just weeks after the Kennedy assassination. 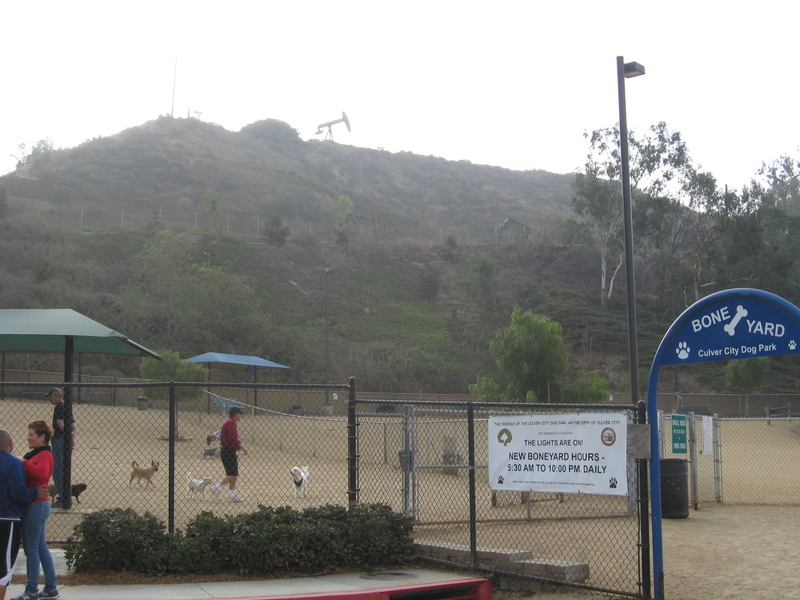 In any event, I’ve wanted to go see the site of the Baldwin Hills Dam for some time now, and it’s only a few miles east of Culver City and the dog park. And to add to the connection, the prevailing thinking now is that the dam collapse was probably caused by ground subsidence due to operations in the Inglewood oil field just south of the reservoir. 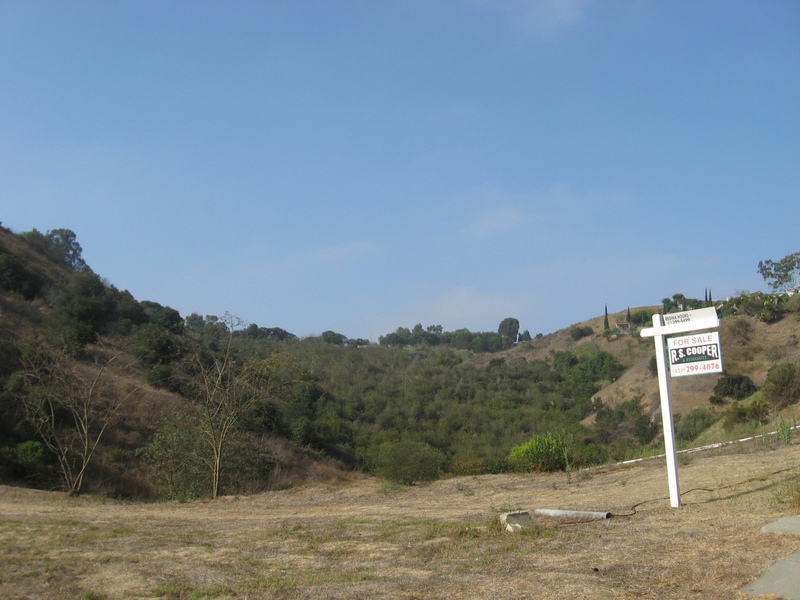 The remains of the dam and the bowl of the reservoir have since been landscaped and turned into Kenneth Hahn State Recreation Area. So I rode over to Baldwin Hills, and I headed up a street that looked like it might lead to a way in to the park. 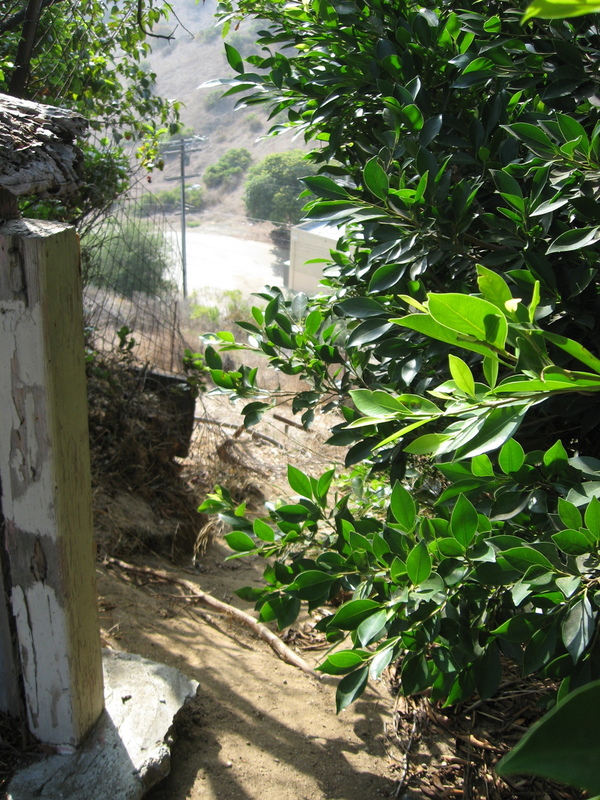 The main entrance to the park is on La Cienega Blvd, but on the section that was built decades ago as a section of the planned Laurel Canyon Freeway. Even though it’s officially just a street, I really don’t want to be riding my bike on the freeway, so I was looking for another way in to the park. I rode up a steep hill to a place where I had a good look at the former dam, complete with the dip in the wall where it broke. I continued on up to the end of the street, where there was a locked gate. So I asked someone who was out walking in the neighborhood. 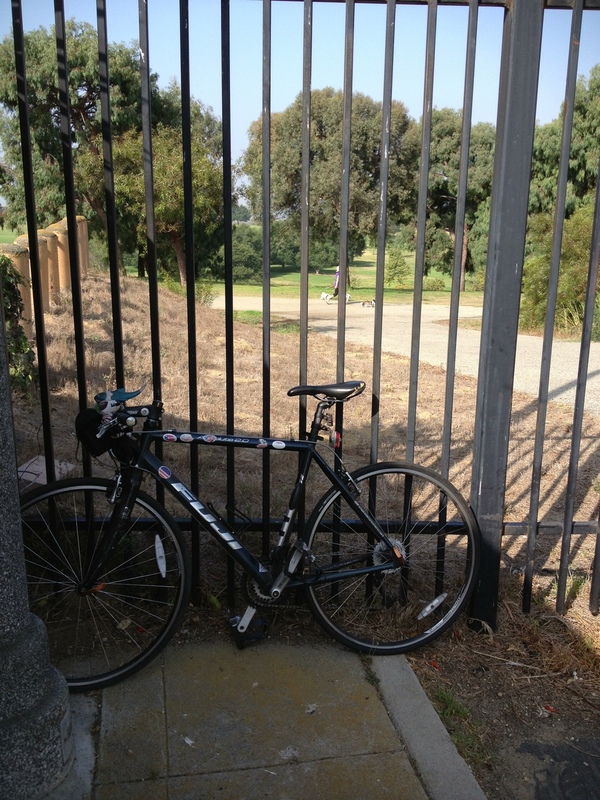 She said that she thought there was a way in off the street on the other side of the former reservoir, so I rode back down the hill and up the other side, only to find more locked gates. I finally did find a gap in the fence with that looked like a goat path that may have led into the park. But that’s not really what I was looking for. The only lesson I can draw from this is that for some reason, the powers that be REALLY, REALLY don’t want people to come to this park by bicycle. Still, I did get a pretty good view in through the gates to see the nicely landscaped bowl of the former reservoir. On my way back down the hill, my phone made some noise. It was a message from the nurse that Kathleen’s operation was nearly done, and that everything had gone well. So I headed back to the hospital. As I’d learned back in 2007, going for a bike ride is a good way to pass the time while waiting for these sorts of things. So it worked out well for both of us.